This On Belay first appeared in Alpinist 37—Winter 2011. I'm pawing over maps in the warmth and soft light of my home. It's early November in Concord, New Hampshire. With the exception of the oaks, all the deciduous trees have dropped their leaves to the ground. I pause to look out the window: the leaves are being swept up by the wind, life breathed into them once more. They crash against the glass and fly on as quickly as they came. Daylight savings time is over. Winter is about to begin. I run my finger along the paper contours of the map, over ridges and drainages, and my mind moves beyond the guidebooks, the printed and the known. I speak softly to myself as I see the possibilities, and these are endless. MANY YEARS AGO, I looked over a topo map of California's High Sierra. Nearly 3,000 miles away, the tight contours and jagged ridgelines of the Evolution Traverse made my heart rate quicken. Images of the Italian Dolomites, the Canadian Rockies, the Tetons and the Wind River Range all had the same effect. But after I visited those places, I realized the challenges of the high peaks could also be found near my home. The White Mountains of New Hampshire are old and relatively small. But they are wild, deep and real. Although Mt. Washington, the highest peak of the Northeast, is a mere 6,288 feet, I've suffered and been left as breathless there as anywhere else on this earth. The range is full of adventures—once you let go of preconceptions and learn to see. Enchain five lines on Cannon Cliff in the summer, and you have fifty pitches and more than 5,000 feet of rock. Spend a winter's day climbing up and down the eight ice gullies of Huntington Ravine, and by evening your legs burn and your breath hurts. While the altitude is only 5,500 feet, at the end of the day, you'll have rambled over 10,000 feet of elevation gain and loss. You'll feel a hint of mind and body separation. Make one mistake, however, and you might fall for hundreds of feet. Although by now I know the region well, I still pour my imagination into its maps. I'll never tire of the gulfs and ravines carved by glaciers so long ago. Strewn with gigantic boulders, the ancient cirques give rise to trackless drainages. Pick a hike up any of these watercourses, and you'll pass steep cascades that none or few have climbed; you'll glimpse places where only moose, bobcat, bear and fox have been. In the warm seasons, the jungle of woods smells of earthy humus. To clamber up each level of flora feels like moving through life. Gradually, the young saplings of the soft, lower environment turn into the mature trees of the upper slopes. Higher still, the plants change yet again, into a shrinking, twisted form of existence. This steep land of stunted fir, spruce and alder extends along the headwalls and over the blunt, old ridges. The krummholz are weathered and stout. Year after year, they endure damaging winds and heavy snows. These dense, small trees don't yield easily to human passage, but they are the gateway to the alpine zone. And then—as if to reflect the brevity of our own existence—they're gone. Over the years, I've conjured many visions of journeys in this upper realm of rock, snow or ice. Some have become real. All have been long days of soloing, mostly alone. There is beauty in continuous movement: flowing with your surroundings the way a trickle of water runs down a hill. To wander upward, past grasses and wildflowers, granite cracks and faces, through loose and mossy upper rocks to the open slabs and summits. To attain this rhythm with only your thoughts as gear—this is climbing for me. IN WINTER, THE EVENINGS of planning and dreaming take on more meaning. Darkness falls quickly. The landscape becomes cold and dormant, covered with snow and rime. Water ice materializes from seeps, cascades and falls. Thoughts transform into actions. The conditions of a route are never the same from year to year, or even from week to week. The ice season is short, unpredictable and mortal—like us. By late season, the snow changes in the alpine zone, creating deep drifts, spruce traps and high avalanche danger, but also covering huge talus fields and opening rough ground to fast ski descents. As the snow transforms to neve, travel becomes a pure pleasure. Big days of enchainments are possible. When the night lifts, a pristine light shines across the mountains, and it seems to burn inside me with the same intensity. An energy flows, pushing me toward the rosy glow above. At sunset, the light fades from rich golden honey to dull burnt orange. The day wanes, and the energy mellows—for the moment. There is always a new adventure, another level to reach for: the unknown of how far I can push myself. During the winter of 2010, I decided to climb all the Huntington ice gullies twice in a single day. Many people, myself included, have done them all once in a day. But two times? Perhaps someone has. I've learned to dismiss the idea that no one else has accomplished something I might envision. All that mattered, however, was my own experience. Under the cover of darkness, I crept from the trailhead to meet the mountains with just a small pack and my thoughts. From dawn to dusk in the ravine, I climbed up and down some 23,000 feet of ice and snow. Mind and body mirrored changes in light, frozen water and shadows, as if scripted and right on cue. Long ago, I envisioned a "Prezolution Traverse": three ascents and descents of routes linking nine summits and three ice-climbing areas (Madison Gulf, Huntington Ravine and Mt. Webster) along the entire twenty-six mile Presidential Ridge. The snow would have to be perfect, with little post-holing. An hour of floundering could drain my energy too far. It took years to get the conditions and free time. On March 20, 2011, everything aligned. The evening before, I was packing when my friend Gabe Flanders called. Two years earlier, at an American Alpine Club event, this tall, lean man had told me he was trying to beat my time on Mt. Webster's Shoestring Gully. While we talked, I sensed a balance of competition and humility, which I liked. Although we'd never climbed together before, I knew Gabe shared my spirit. Now, as I explained my plan, I could feel his excitement. Without any hesitation, we agreed that he should join me. AT 4 A.M. THE SNOW CRUNCHES and squeaks underfoot. The air is cold and still. Gabe and I are half a mile into a twenty-six-plus-mile day, heading to the Madison Col. My mind slips into space. The beam of my headlamp catches the snow crystals as they fly off Gabe's boots in a miniature light show. Higher up, I reach off the side of the trail with my ski pole to test the firmness of the untracked snow. It's perfect. We tread in silence. There are no other human sounds. The stars falter as we crest the col. The sky warms from black to deep indigo to lighter and lighter shades of blue. Then the orange crack appears—an opening on the horizon—and the light rushes in. Far away, Sebago Lake shimmers like a white plate on a green tablecloth. 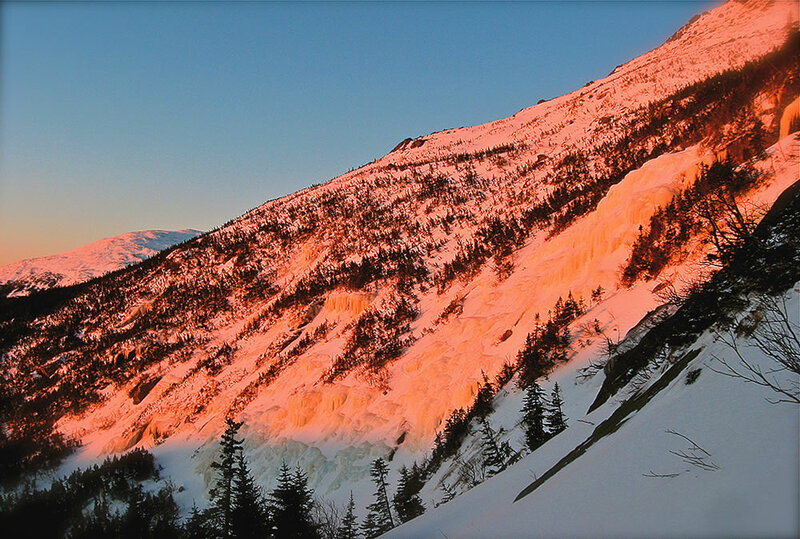 The sun illuminates the higher summits of Mt. Jefferson, Clay and Washington with an antique gold. We pause. Birds sing from the scrub. Gabe and I look at each other and smile. We both realize what we've found again, for the first time. Next comes the plunge down a steep, wooded slope into the remote Madison Gulf. On top of firm snow, we open up into a run, dodging gnarled spruce and fir as if we're playing a game. Our first route, Point, will lead us to a long snowfield and the summit of Mt. Adams. Five hundred feet of ice glow in the early morning light. I know I'm where I belong: in the midst of a dream, creating my own visual and invisible map. IN A SENSE, I'M NO ONE. Although I've climbed for thirty years, I've never cared about high number grades. Some rock crags have filled me with awe. But they've never had the magnetism of regions where the guidebook is simply that—a guide. With each year of my life, I've become more drawn to following maps into obscure areas and exploring whatever I find, working with my environment and not against it. Movement and imagination can transform even well-known places into new terrain. In 2010, when Steve House soloed Repentance and Remission back-to-back on Cathedral Ledge, he wasn't climbing a couple of classic routes on an urban cliff anymore—he was traversing an untried wilderness of ice, encountering nature on its own, augmented terms. It saddens me to see a ladder lashed to another popular New Hampshire crag as "an extension of the trail," so that visitors no longer have to climb a beautiful open book to reach the more strenuous routes above. When I hear climbers talk of "upgrading" once-pristine rock with permadraws, I wonder: Is this the history that should be left in our wake—wild places beaten down, climbing practiced on a level of pure convenience? My mind works in the opposite direction. As routes and lives become more prescribed, wandering seems like a form of quiet protest. ALL THE WAY to the top of Adams, the texture of the ice and snow is flawless, as though we had a hand in its making. The rosy hues of sunrise fade. The ice-light morphs to its true color, a combination of blue and sage. Above the cascade, the snow is firm and steep. My legs are already sore, and yet as I move amid boulders and small cliffs, I forget the pain in the wonder of this place. I stop to watch Gabe weave between the islands of rock below. He's moving fast, and I know he must be feeling good. Beyond him, over the huge drop of the ice cliff, the forest is now a miniature, dark world. On the summit, we drink and eat among frost-feathered stones. It's 8 a.m. Southward, a line of pure white peaks flashes against a cobalt sky. It's time to move. At least twenty miles, eight summits and two more ice routes to go. The snow gleams hard beneath our feet as if coated with tiny diamonds. After the short rest and the food, I feel new again. Shadows of peaks beckon. Immaculate snow entices us into a jog. Gabe and I roll over the tops of Jefferson, Clay and Washington, stopping only for a moment on each. On Washington, we encounter the first people of our day. We almost omitted this mountain from the linkup for that reason: when you enter a mental zone like the one we're in, the longer you're alone the better. But our visit of the summit is brief, and in no time, our backs are to the crowds, and the chatter of voices is gone. At the lip of Huntington Ravine, we rest before descending Diagonal Gully and climbing back up Yale. Before Gabe and I try to eat, we sip tea to soothe our throats after hours of breathing cold, dry air. 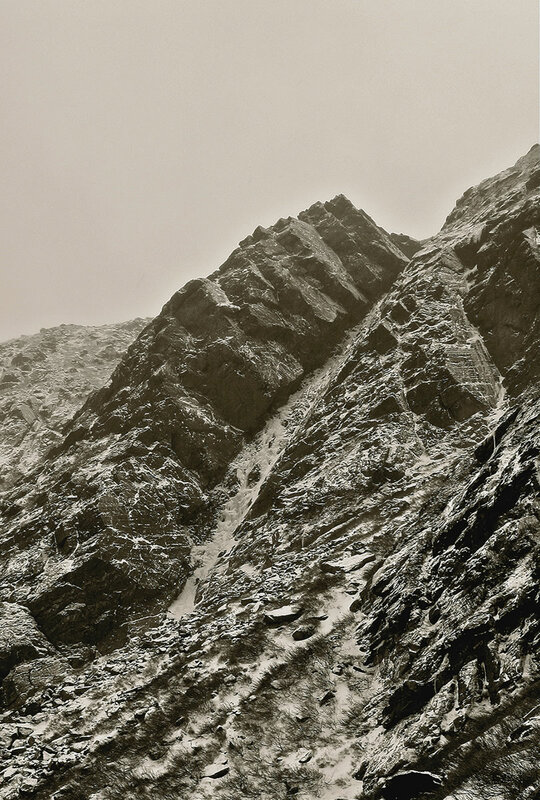 Gabe sits hunched over with his head bowed low; he set a savage pace over the last few peaks. I look down into the ravine and think about early great climbers like Robert Underhill and Noel Odell who began exploring these rock ridges and ice-choked gullies in the 1920s. But I also think about the bright, lime-green lichens and the little plants scattered about the headwalls. During the summer, they shine in a light of their own. I admire how they endure each harsh winter. Some are buried under drifts. Others are exposed to the elements, wherever the wind scours areas clean of snow. I try to mimic their steadfast style whenever I can. Since Gabe and I will be looping back to this spot, we leave our packs here. Yale Gully rises in a continuous crease up the center of the main headwall. 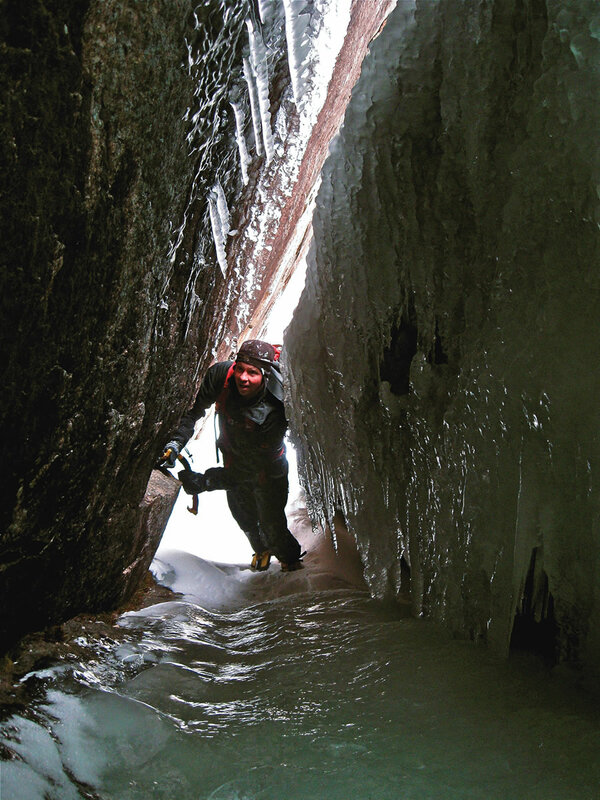 This 1,000-foot ice climb is easy, but it's also the longest of our traverse. Partway up, water spurts from one of my pick placements. I call Gabe over, and we take a long drink. I wish we could fill our nearly empty water bottles, but they're still in our packs. I'll chastise myself for that decision many times throughout the rest of our day. Brilliant light warms the bulges and the long ice slabs, quickening our ascent. By the time we climb over the little cornice at the top and return to our packs, we've been gone for less than an hour, yet the sun is slipping lower. 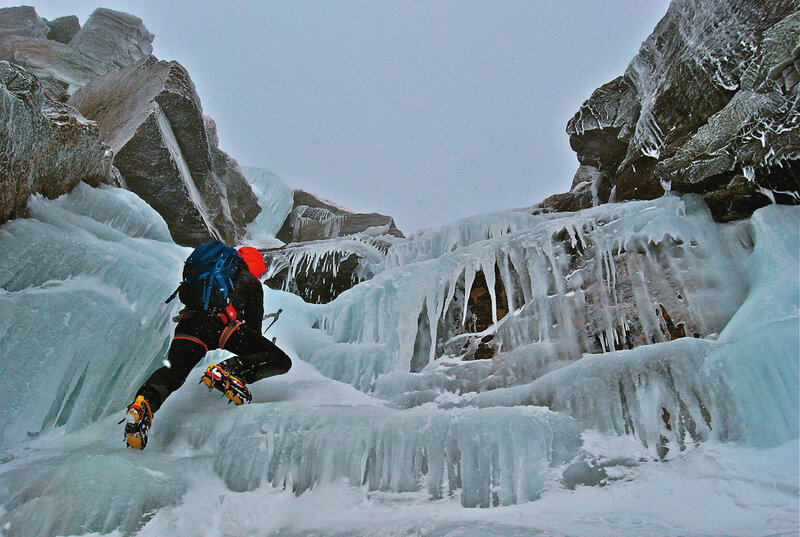 About fourteen miles, five summits and one more ice route remain. Our path now heads south and around the huge cone of Washington. We cross the flats of the Alpine Garden and on over to Mt. Monroe, looking out across the southern range, where the mountains begin to turn from stark white to shades of alabaster and green. Mt. Eisenhower's big bald summit is the last above treeline. We have three mountains and one ice route left, but as the elevation decreases, the ground conditions change. Beyond Mt. Pierce, the drifts seem bottomless, and the trail to Mt. Jackson is gone. We fall into spruce traps, sometimes up to our armpits. Our curses fill the quiet woods. Thirst consumes my thoughts. Near dusk, we reach the little open summit of Jackson. Although it's fewer than two miles from Jackson to the 3,910-foot Mt. Webster and the last ice climb, the snow ahead is just as deep and soft as the snow behind. I look south toward our goal. The distant mountains are gray and purple layers retreating into the west. The energy in me dims with the last of the light. I hear Gabe speak, but it takes me a moment to assemble his words into a coherent sentence. "What do you think?" he asks again. Sweat runs down his weary face. Miles of wet snow have left his clothes damp. The cold is setting in. I have to decide now. We have to go down. What started as a simple thought has now become a map of memories that reappears each time I look at the paper version. The Prezolution Traverse remains unfinished, along with other winter journeys that are still merely imaginary. Nothing I do is spectacular, yet my goals and the way I approach them are different and not always in sync with the social norm. There is beauty and challenge hidden around every corner if you open a map and your mind. As you begin to imagine different itineraries, some may catch your eye, but pursue only those that capture your heart. Then go farther—for this is the unknown, and its only ending is in the self, not the terrain.